Space is limited to 15 students! Join sketching artist Marc Taro Holmes, author of The Urban Sketcher: Techniques for Seeing and Drawing on Location for a two day sketching workshop in Richmond VA, sponsored by Strathmore. This workshop is accompanying Architecture Week at the Virginia Center for Architecture, and the ongoing exhibition Urban Sketchers: Sketch Virginia. We will be working primarily in black and white. Color materials are optional, at your preference. 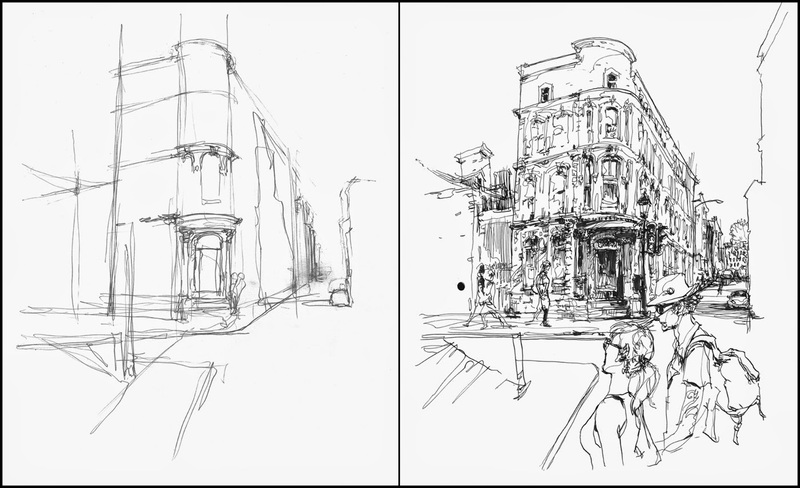 Exercises focus on the very basics of urban sketching. That is, black and white pen-and-ink line, accented with brush pen. It will be a unique opportunity to practice the fundamentals of urban sketching with a diverse group of artists. Note: Participants will qualify for AIA Learning Units. Each day we will begin at the VCA and walk out from there. Registration fees to VCA are $US220. Click here for Online Registration. Since 2009, Montreal based artist Marc Taro Holmes has been a correspondent and travelling workshop instructor for the international reportage artist collective urbansketchers.org. He is the author of the how-to art book The Urban Sketcher: Techniques for Seeing and Drawing on Location as well as the online class Sketching People in Motion. Marc’s website citizensketcher.com is an ever growing journal of stories and images from his travels. Stop by and subscribe for free email updates from wherever Marc is today. You’ll find drawings and paintings done on location, reportage sketching of live events, step-by-step notes on technique, reviews of art materials, and news about the wide world of location sketching.